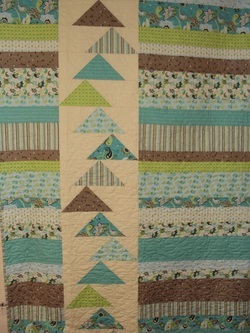 Big, beautiful flying geese weave a whimsical trail through this simple striated quilt top. Pattern is by Creative Sewlutions. Great contemporary look is equally effective with and without borders. The fabrics are from the Pinfeathers - Peacock Blue Collection by Carina Gardiner for Northcott. This kit contains the pattern and fabric for the top and binding. Finished quilt does not contain borders and measures approximately 55" x 75".